Chinese PC maker,Shenzhen K.R.T. Technology recently released their latest Tablet PC ,the all new KRT X9 in the market.The New Tablet PC comes with multitouch technology.The X9 Tablet PC runs on Windows 7 operating system. Shenzhen K.R.T. X9 Tablet PC is housed with a 10.2-inch touchscreen display with resolution of 1024×600 pixel features multitouch technology, 1.6GHz Intel Atom N270 processor, an Intel GMA 950 GPU.Other Features of KRT X9 includes 1GB of RAM, 160GB hard drive, Wi-Fi 802.11a/b/g, three USB port, VGA connector, and 4-in-1 card reader (SD/MMC/MS/MS Pro).The New Tablet PC also supports WCDMA, TD-SCDMA, CDMA2000 3G connectivity. The New X9 Tablet PC from Shenzhen also includes 2,800 mAh or 3,500 mAh battery capable of providing a backup up to 4 hours.The X9 Tablet PC weighs about 2kg and has dimensions 226.3×166.9×24.7 mm .The Shenzhen K.R.T. 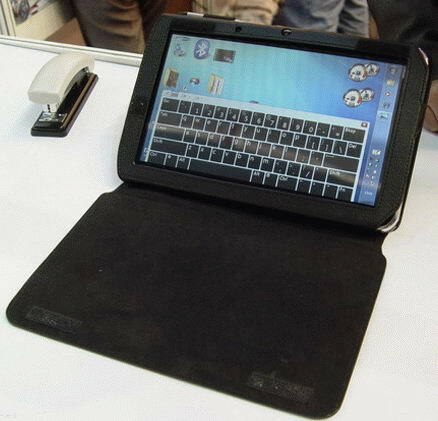 X9 Tablet PC comes with a price tag of about 4000 Yuan (about $588).